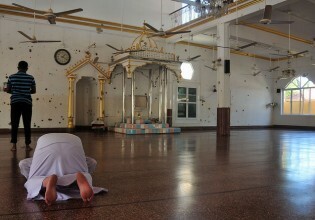 It is a Tuesday afternoon and only a handful of devotees have flocked to the Meera Grand Mosque in Katankuddi, about 300 kms east of the capital Colombo. It is an oasis from the scorching heat outside. The three-storey, centrally air-conditioned Cargills Square, a major mall in Sri Lanka’s northern Jaffna town, is the latest hangout spot in the former warzone, where everyone from teenagers to families to off-duty military officers converge. Sri Lanka’s newly-installed government, which has pledged to set up its own domestic tribunal to investigate war crimes charges, is seeking political and moral support both from the United States and the United Nations to stall a possible international investigation. When the initial results started trickling in a little after midnight on Jan. 9, it still wasn’t clear exactly which way the country would swing: had Sri Lanka’s 15 million eligible voters thrown in their lot with incumbent President Mahinda Rajapaksa for a third term? Or would the desire for change put common opposition candidate Maithripala Sirisena at the helm? As 14.5 million Sri Lankans prepare to select their next leader, there is growing fear that violence could mar the Jan. 8 elections, billed as the closest electoral contest in the island’s history. These days, the national greeting in Sri Lanka is a simple question: “So, what do you think?” Everyone from van drivers waiting to pick kids up from school, to mechanics repairing vehicles, to barbers cutting your hair have only this question on their lips. It took just 30 minutes for the killer waves to leave 350,000 dead and half a million displaced. Less than one hour for 100,000 houses to be destroyed and 200,000 people to be stripped of their livelihoods. Priyantha Wakvitta is used to seeing his adopted city, Colombo, transform into a landscape of bright sparkling lights and window dressing towards the end of the year. The kids of Kodikaman, a dusty village straddling the newly laid railway line in Sri Lanka’s northern Jaffna District, enjoy a special treat these days. The last time there was mud on his village roads was about a year ago, says Murugesu Mohanabavan, a farmer from the village of Karachchi, situated about 300 km north of Sri Lanka’s capital, Colombo. In this dust bowl of a village deep inside Sri Lanka’s former conflict zone, locals will sometimes ask visitors to rub their palms on the ground and watch their skin immediately take on a dark bronze hue, proof of the fertility of the soil.